I had something entirely different to share with you today – it was going to be a meal of sustenance, instead of another dessert. However, after serving these little delicacies last night, I decided that I must get this recipe out ASAP so that you can make them ASAP. I’m pretty sure these made both the gator’s and the buckeye’s losses yesterday seem less painful (at least to the people who might be pained by that sort of thing). These treats were the perfect way to start off October. They are sweet, nutty and flakey. As a true candy lover, I think part of the reason I like these is because the brown sugar becomes caramelized on top as it mixes with the pecans, creating an almost toffee like texture on the outside with a sweet and melted inside. Because I only had enough cupcake pans to make 24 of these at a time, I ended up running out of filling for the last tray. While you’d think that extra filling would always be a good thing, it seemed like most of that extra filling just spilled out onto the pan and made a mess. Therefore I would recommend measuring out half of the filling if you are making these in batches, so you have a better idea of how much to use. 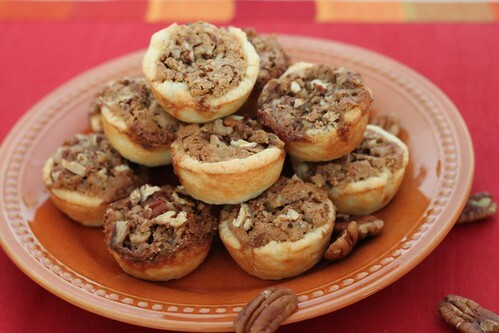 Basically these are like a miniature pecan pies, with a slightly more solidified filling and an amazing crust. They also smell amazing while baking. And I’m pretty sure they would perfectly complement a nice big glass of apple cider. So go ahead and enjoy a few (or 10) for dessert, or for breakfast (like I did today). Happy Fall! 1. To make the dough: beat butter and cream cheese together until combined. Add the flour and mix until incorporated. Roll the dough into 48 individual balls (each ball should be a little smaller than a quarter). Place the balls on a plate, cover with plastic wrap and refrigerate for about an hour. 2. To make the filling: combine all ingredients (brown sugar, pecans, eggs, butter, vanilla) in medium bowl and mix to combine. Divide this into even halves if you are making this in batches. 3. Preheat the oven to 350 and lightly grease mini muffin pans. 4. To assemble: Take a ball of dough and roll it out into a flat circle. Place inside a mini muffin cup and repeat with remaining dough. 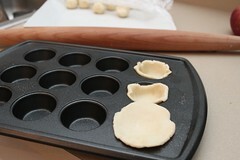 Alternatively you can simply press the dough ball inside of the mini muffin tin to create a cup. I was worried about the crust being uneven, which is why I chose to roll the balls out, but to save time you can use the other method. 5. Fill each cup with a heaping teaspoon of filling. Top each with a sprinkle of roughly chopped pecans. The filling puffs up while baking, so it is not necessary to fill to the brim of the cup, in fact this tends make a mess because the filling overflows. 6. Bake at 350 for 20-25 minutes. Let cool slightly in pans, then transfer to a cooling rack. Store at room temperature in an airtight container. Source: Brown Eyed Baker, originally adapted from “old firehall ladies auxiliary cookbook”. This entry was posted on October 2, 2011 by Spice Is Nice. 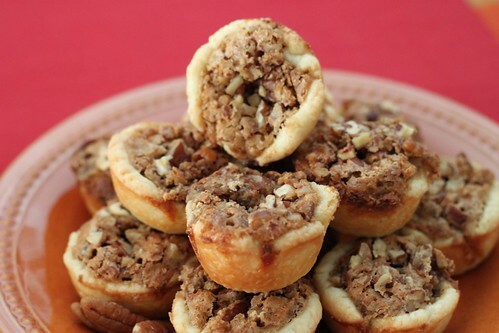 It was filed under Cookie, Dessert, Pie and was tagged with brown sugar, crust, Miniature pecan pies, Pecans, Tassie. PLEASE SEND ME SOME OF THESE!! I’m sooo excited!!! I actually have all of these ingredients right now!!! Yeah! They look absolutely scrumptious!!! 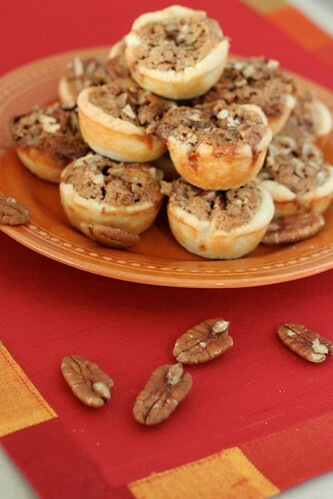 Jacqueline, I made these because your uncle John loves anything and everything with pecans. And they were absolutely delicious !! Thanks for this great post . I’m so glad you got to make them! I hope we get to see you soon!